Jane has finally met a vampire that might be tough to kill and her beast can’t help her. One of the original sons of darkness, the markers of the vampire race, has escaped vampire headquarters and is on the loose killing humans. Jane has been called in by both the human and vampire authorities to stop the rogue vampire, but she’ll need help from her business partners and friends to do it. As Jane’s powers have been growing, so has her own uneasiness with her place in life. She’s not entirely sure what she believes anymore and how it fits into the new world view. It’ll take all her effort and the combined help of her friends to take down this super powerful vampire, if that can even happen. 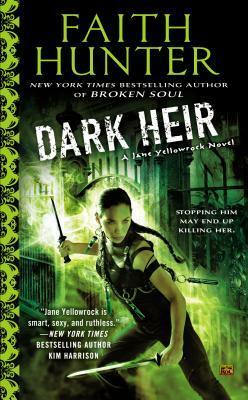 Dark Heir is the ninth book in the Jane Yellowrock series by Faith Hunter. I suppose any action based book could, theoretically, be read as a stand alone since the focus is always on the action scenes but I wouldn’t recommend it. The characters, especially the large supporting cast, and plot rely heavily on reader knowledge of past events and complicated relationships for the book to fully make sense. So readers should ensure they’ve read the main books in the series before picking up this one. Here the plot is incredibly similar to the previous books – bad guy on the loose and only Jane can stop them. The story has upped the power of the bad guy to correspond with Jane’s own increasing power and ability. Jane is pretty super powerful in this book and only an uber powerful vampire can really match her now. The focus is solidly on the detective work to figure out where the vampire could be and then the several fight scenes between Jane and co. and the bad guy. In some ways this works since the writing strengths are definitely in the action of the plot. It helps move the story along when I found it somewhat boring at times. I got frustrated with Jane’s all powerful new presence and kind of hated how she could survive literally anything. Not to give spoilers but the fact that she survives the ending and –then- kills the bad guy is almost ludicrous. I feel as though the story focused nicely on Jane but left out the most interesting secondary characters – Leo, Beast – and as always I’m so tired of Jane assuming that everything is always her fault. That kind of guilt is wearying when it’s so clear it’s untrue and unproductive. It also shows incredible arrogance that she feels she controls all destiny, both past and present. I really wanted to tell her to get over herself repeatedly. That said I like this series for the most part, although this was a more introspective book focusing almost exclusively on Jane and her internal whining in between fight scenes. I think the other books have been stronger with their inclusion of the other characters and a more dialogue based story. I think fans of the series will enjoy this addition as it’s a classic JY story in almost every way. It has some differences and fans can decide if they like them or not but I don’t see this as a permanent departure for the series, more like one that didn’t work as well for me. I’ll still be getting the next book and hoping that there’s more of the witty banter and secondary characters that make the story shine so well.